Reading aloud is a preserved ability in dementia and many individuals, even those in the later stage of the disease, enjoy reading to others. These short, illustrated stories feature large-print text and full-page, high-contrast color illustrations to accommodate the reading needs of people living with dementia and other cognitive impairment. A large-print question is presented at the end of each page of text to encourage conversation and interaction. 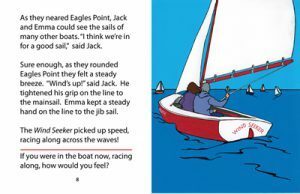 Emma has dreamed of sailing since her childhood. She and her grandfather, Papa Jack, worked hard to restore an old sloop. Now the day has come for a first sail. Will Emma be ready to sail the Wind Seeker? Large-print three-part cards with bold, full-color illustrations of 6 meadow wildflowers. Non-glare lamination for easy viewing. Large-print three-part cards with bold, full-color illustrations of 10 garden vegetables. Non-glare lamination for easy viewing. Large-print three-part cards with bold, full-color illustrations of 8 woodworking tools. Non-glare lamination for easy viewing. Large-print three-part cards with bold, full-color illustrations of 6 shore and water birds. Non-glare lamination for easy viewing. Large-print three-part cards with bold, full-color illustrations of animals, buildings and equipment around the farm. Non-glare lamination for easy viewing. A person with dementia can read the story to a small group of peers and present the question at the end of each page for group discussion. A family member or care partner can read the story aloud to a person with dementia and use the questions to reminisce or inspire discussion. The stories follow an intergenerational theme to interest both older adults and children. A person with dementia can read to a child or with a child and experience the positive effects of interaction with children. A person with dementia can read the story alone, either silently or aloud. Most enjoy reading aloud.